Today's program sucked pond water. Not because of the material, but because of the group! Look,when you sign up 19 kids for a program and only 7 of them show up on a given week you are going to have trouble. And when they are toddlers,it gets even worse. Most of today's group spent their time either wandering around the room or flopping in their parent's laps or rolling on the floor. This would have been fine at "Mother Goose Time", but these kids are supposed to be almost 2 year olds, learning to interact at a story hour. I have one little girl who participates well and a little boy whom I adore--he was the only one with a nanny today and she was the only one really interacting with him at all points. And the thing is, this is NOT a bad program. I know because I've done it in past years with other groups of toddlers and it's been a big hit! If you've looked at my sidebar you'll have see that I made a batch of art foam puppets to tell this story and that is the way I do it for the older kids. But with these little ones, I used the "Big Book" version of the story. This is available now as an oversized board book, perfect for toddler to share with their parents. 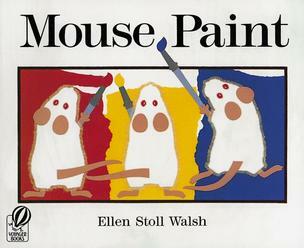 I have never, ever been in a preschool, daycare center or kindergarten that did not own a copy of this book. When my daughter SC was in kindergarten her teacher used this book for the first month of school to practice everything from animals to colors. This is a perfect book for kids to use when learning to read, because it has a predictable pattern and clues in the text. 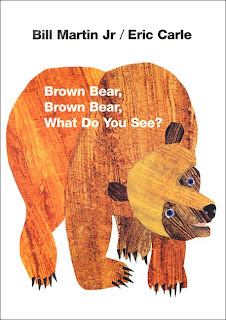 Combine that with a lovely rhythmic text and artwork by Eric "Never Won A Caldecott" Carle, and you know why this book has been around so long. Long ago, one of our talented staff made us big cutouts of these characters. He did them freehand, talented guy that he is, but you could easily do the same with a color copier, and then laminate them or cover them with Contact paper. You could magnet tape the back, but I just like to hold them up one at a time. Shameful confession:I always had to grab the book to put these in order since we didn't number them. Wasn't until today that I realized that they are basically in color spectrum order, aside from the bear and the goldfish! This was the day to break out the egg shakers and the scarves and it would have been lots of fun if the parents had participated more. I thought these folks go to Music Together and the like--wonder how they behave there? Anyway, we did the "Egg Shaking Song" and "Dancing Colors", both from Nancy Stewart's wonderful website And then, just for the heck of it we did "Scarves On Your Laps" from Johnette Downing's "The Second Line", a great source for lots of scarf activities. 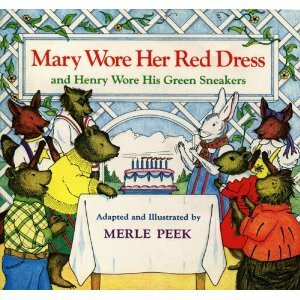 "Mary Wore Her Red Dress" is a book adapted from a popular children's song, and you can hear lots of versions of it on clips from Amazon. We didn't do the book, just the song version, using each child's name and clothing for the verses, as in "Benjamin wore his red shirt....Olivia wore her purple dress.." and so on and so forth. I don't expect toddlers to act like elementary school children. I am not the sort of librarian who does 3 dear little books and a flannel board and expect the kids to stay still except to wiggle their fingers during a bad fingerplay I made up to go with the theme of the day!!! I keep age groups separated because 0-11 month "babies" are vastly different from 12-23 month old "toddlers". And in both groups I seldom do books but lots of interactive, "stimulating" rhymes, songs and games that encourage interaction between parents/caregivers and children. My hope is to send them home with something they can play at home. If they just wander around the room, fine by me, as long as they don't poke other kids or pull their hair. And among those 12-23 month olds there is a big difference between a 12 month old and a 22 month old. ALL of these kids were 20-24 months old--special program just for them, which included plenty of "stimulating" stuff that encouraged participation. It helps a lot if parents/caregivers participate. As I noted here, the kids ran amok and the parents just sat there. No matter how good you are (and I've been told for years that I'm really, really, good, take that as you will) if you don't get adult participation when dealing with small kids, things aren't going to work well. Forgot to add that I had done this same program with the exact same age group for 3-5 years and this was the only year I had problems of this sort.